4/28 Cup of Coffee: Salem used a 10-run eighth inning to win for just the second time in its last six games. Portland submitted another lackluster performance, dropping its seventh straight. In Greenville, a strong day from the Basabe brothers wasn't enough as a late-inning rally by Delmarva sent the Drive to their sixth loss in seven games. The Sea Dogs dropped their seventh in a row, as they were shutout by the Mets. Ty Buttrey fell to 0-4 on the season after allowing four runs (one earned) on four hits and two walks in 2 2/3 innings. Heri Quevedo followed, allowing a run on two hits and two walks in 3 1/3 innings of relief. Portland mustered just four hits, with Wendell Rijo's double the only of the extra-base variety. The Sea Dogs will look to snap out of their funk when they return home on Friday to face Reading. A 10-run eighth inning propelled the Red Sox past the Keys. Dedgar Jimenez started for Salem, allowing five runs on eight hits and two walks in 4 2/3 innings. Adam Lau (3-0) picked up the victory, allowing two runs on one hit in 2 1/3 innings of relief. Mario Alcantara hurled the final two innings and didn't allow a base runner. Down, 1-0, in the second inning, the Red Sox grabbed a 2-1 advantage on an RBI double from Rafael Devers and a sacrifice fly off the bat of Ben Moore. Devers's two-run home run in the fourth gave the Red Sox a 4-2 lead. Frederick plated three runs in the fifth and two in the seventh, taking a 7-4 lead. However, Salem exploded in the eighth thanks to five straight bases-loaded walks and a Mauricio Dubon two-run single. The biggest blow came from Andrew Benintendi (pictured, above). He cracked his first home run of the season, a three-run blast that put the game out of reach. Devers's strong performance (2 for 4, four RBI) helped raise his average 27 points to .149. Benintendi extended his hitting streak to 16 games while Yoan Moncada saw his end at 15. A late-inning rally by the Shorebirds helped sink Greenville, which has lost six of seven. Daniel Gonzalez took the mound for the Drive, allowing two runs (one earned) on five hits and three walks in four innings of work. Austin Glorius was steady in relief, allowing one run and striking out three in three innings of relief. Anyelo Leclerc took the loss, allowing two runs (one earned) in his lone inning. Down, 1-0, in the second, Greenville tied the game on a Roldani Baldwin RBI single. In the fourth, a two-run single by Trenton Kemp gave the Drive a 3-1 advantage. Delmarva scored a run in the fourth and the fifth to knot the contest. The Shorebirds went ahead for good by plating two in the eighth. The Basabe brothers led the Drive, combining to go 5 for 8 with three doubles, a triple, and two runs scored. Greenville was just 3 for 13 with runners in scoring position, and struck out 13 times. Player of the Night: Andrew Benintendi, whose three-run home run capped a 10-run eighth inning that drove Salem past Frederick. Benintendi has hit safely in 16 straight contests and is batting .338 with a home run, 14 RBI, eight doubles, and six triples in 19 games. 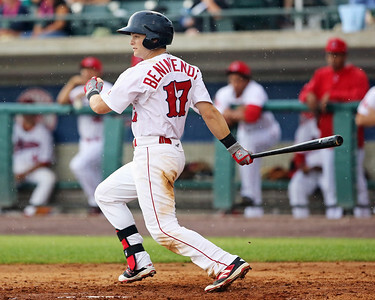 Benintendi leads the Carolina League in triples, is second in doubles, and second in slugging (.636).